As a member of the Music Together family, you have access to the Family Music Zone™. Here, you’ll be able to download this semester’s songs, view a digital copy of your songbook, get new activities to try at home, and learn more about your child’s music development. If you are having any problems setting up your account, accessing the songs online or downloading the songs, check these frequently asked questions below. For a PDF version, click here. What is a Music Together account, and why would I want one? Your account allows you to access our range of digital services, from our activity filled Family Music Zone, to our “Hello Everybody” mobile app and more! Accounts are exclusive to Music Together families who have taken at least one class, in addition to our licensees and teachers. 1. You’ll need your class materials. Look for the 15-digit code on the inside front cover of your Song Collection CD booklet. 2. Once you have it ready, you can create your account by visiting https://www.musictogether.com/account, or by selecting “Log In” from the menu in our “Hello Everybody” app. 3. Follow the on-screen instructions and when complete you can immediately use your account. How do I add a new collection to my account? 1. Log into your Music Together account, either through www.musictogether.com or by selecting “Log In” from the menu in our “Hello Everybody” app. 2. If you logged in to the web, select “Access Code” from the upper right hand navigation bar. If you are using the app, select “Access Code” from the menu. 3. Enter your new code, and click/tap “submit”. Your new music will immediately appear in the Family Music Zone and the app as long as you are logged in. What if we are enrolled in two class types (e.g., mixed-age and Rhythm Kids)? You will use one of the codes to create your account. Then, add the second using the steps above. All of the songs and activities for each class type will appear on the dashboard when you log in, or in the available collections in the app. Simply go to Simply go to https://auth.musictogether.com/Account/BeginPasswordReset to reset your password. The new password will be emailed to you. If you don’t have access to the email you used to create the account, contact us at: support@musictogether.com. What if I need help or can’t find my code? Contact our support at: support@musictogether.com. What is the Family Music Zone, and why do I want to go there? 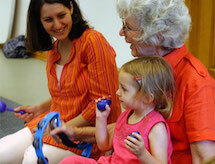 The Family Music Zone is an area of our website just for families enrolled in Music Together. There, you’ll be able to download the semester’s songs and explore resources, activities, and more to help you make the most of your Music Together experience. Your Family Music Zone Homepage will display the songs and semester-related family content for whichever unique Music Access Code you most recently entered. Content for previous semesters will get automatically archived in the Music area each time you enter the unique code contained in your new semester’s materials. Will we still get physical materials or is everything “going digital”? Each semester you enroll in a Music Together class, you’ll receive an illustrated songbook, one CD, and parent education materials. You’ll also get access to the online Family Music Zone, where you can download digital recordings and enjoy additional activities and resources. Will we still be able to visit the Family Music Zone after we stop coming to Music Together? Yes, after your Music Together class ends, you’ll be able to log in to the Family Music Zone and access your music library and activities for the semesters in which you were enrolled. How do I add this semester’s songs to my iTunes library? First, you’ll download the .zip file containing all of the songs from the semester. The zip file is available on your Family Music Zone home page. After unzipping the files, you may sync the tracks with the music management program of your choice (iTunes, Windows Media Player, etc.). Looking for help unzipping the audio files? On a Mac, simply download the file and double-click to unzip. How do I get the music onto my mobile device? Apple devices: In order to add your Music Together songs to the iTunes library on a mobile device running iOS (iPhone, iPod, iPad), you must first add the songs to iTunes on your computer. Then, you can sync the songs to your device. Android devices: Simply click the download button for the songs you would like to download. They will automatically be added to the music library on your device. Can I download the songs multiple times to put them on different devices? Yes, you may download the songs as many times as you like! How will we listen to this semester’s songs in the future? Music from previous song collections you’ve unlocked will always be available in your Music Library. Just log in to the Family Music Zone and choose “Music.” Accompanying song activities will also be archived there. What if I’d like another CD? You may obtain an extra CD from us free of charge. You’ll just pay a $4.95 shipping and handling fee ($15 outside US), and your CD will be shipped right out to you! (One per family, please, and only available while supplies last.) Go to the Family Music Zone home page and click on the link for "Request extra CD" near the music downloads to request yours. If you need a CD that is from a previously unlocked collection, contact storeorders@musictogether.com.